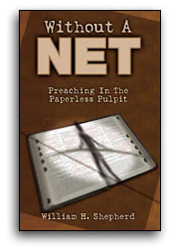 One who preaches without a net must have something memorable to say. The preacher must also say it in a memorable way. The two are separate yet inseparable. Memorable content can and will die without memorable form. Memorable form that has nothing memorable to say will kill any interest in a congregation -- perhaps impeding them from hearing that preacher for years to come, since boring is more easily forgivable than shallow.